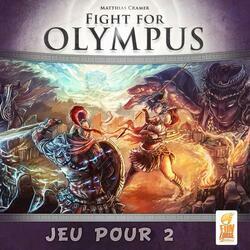 Fight for Olympus is a duel game. Each player starts with a hand of 6 cards, heroes (60 different cards), peoples (24 cards for 6 different peoples) or equipment (12 cards) and will face his opponent facing a small game board representing Mount Olympus, Delphi or Trojan whose takeover will confer benefits in the current duel. Each fight involves the cards placed on each side of the board controlled by the player. The cards of the hand serve as both combat units (heroes, people, equipment) placed on either side of the board in each camp but also money since to put his units must pay a cost payable in cards . The more powerful a unit is, the higher this cost is of course. A game lasts about 30 minutes, the game is very aggressive, fast, addictive and promotes all possible combos between cards.